Auburn, CA – ClipperCreek has just announced availability of a new, durable, low-cost pedestal, the ProMountDuo™. 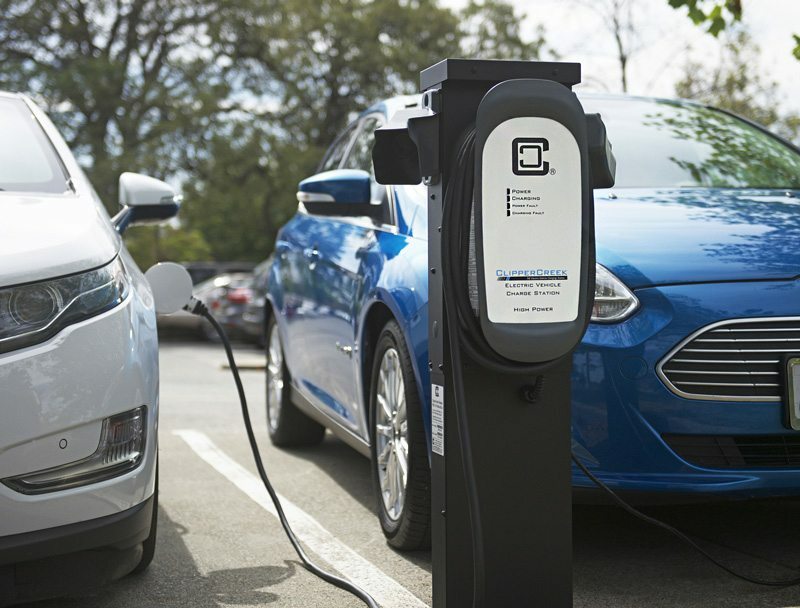 Developed for the fleet and commercial markets, the ProMountDuo™ is equipped to provide single or dual Level 1 or Level 2 electric vehicle charging station mounting options, making it possible to charge two vehicles from one post. The ProMountDuo™ packages ClipperCreek’s best in class product features including galvanized and powder coated steel for environmental durability, a 1-year warranty, and single or dual station mounting capabilities. No additional mounting kit is necessary for mounting the second charger. At $434, it is the most affordable pedestal mounting solution on the market. It can be paired with a ClipperCreek ACS-15, ACS-20 or LCS-20 for $813; the ACS-25 or LCS-25 for $903; and the popular HCS-40 for just $999. The ProMountDuo™ Universal Pedestal is available for purchase immediately at www.clippercreek.com or by calling the ClipperCreek customer service center at (877) 694-4194. To view a video of the installation of a hardwired ClipperCreek EV Charging Station click here. Founded in 2006 by Jason France, ClipperCreek is a worldwide leader in Electric Vehicle Supply Equipment (EVSE). The company offers a wide range of products designed to be the safest, most innovative, and grid-ready EV charging stations on the market. ClipperCreek advances the plug-in vehicle market and broadens the acceptance of the most exciting vehicle revolution in a century. The industry pioneers at ClipperCreek build more than 20 years of real world EV charging expertise into every EVSE they manufacture. All ClipperCreek products are Made in America. For more information, please visit www.clippercreek.com. I have been reviewing you chargers and pedestal mounts. Do you have an enclosure that adds a level of security? This installation is for the parking lot of a residential sales office for a tract home community. This is a short term installation for a year or two. There are 2 locations that I am working on. Thank you for your question! When you refer to security are you looking to protect the unit from theft and/or vandalism? Here is an example of one that would fit our HCS series: http://www.grainger.com/product/WIEGMANN-Junction-Box-Encl-2NJ24?s_pp=false&picUrl=//static.grainger.com/rp/s/is/image/Grainger/2NE71_AS01$smthumb$. If you are looking for a form of access control to only allow certain people to use the station(s) I would recommend ChargeGuard. ChargeGuard is a simple key based access control system that can be integrated with our HCS series (starting at $565 each). With the ChargeGuard enabled HCS unit a user must have a key in order to activate the station. The way the unit works is a user would plug the connector into their vehicle and then insert and turn the key to begin the charge and then remove the key to prevent others from using the station. The station will then charge the vehicle until the connector is removed from the vehicle’s inlet. Once the connector is removed the station will not allow for another charging session until the key has been reinserted and turned again. HCS units with ChargeGuard can be configured with up to 10 different key switches which would allow only the user with a certain key to use a certain station or all units can be keyed alike. Here is a link to ChargeGuard on our website: https://store.clippercreek.com/accessories/chargeguard-access-control-evse. This would need to be purchased at the time the station or stations are purchased.